The Omega Cloud Web Portal gives IT administrators and video meeting organisers unprecedented access to the powerful features of our state-of-the-art cloud service. This portal is the ultimate control panel for administrating or setting up an Omega Video Conference, without the infrastructure requirements typically associated with this type of service. IT administrators and meeting organisers can easily set up a virtual meeting room (VMR) and adjust a video conference’s settings and participants beforehand or in real-time, while guests can join the meeting using the same portal interface. This Web Portal is designed with the user experience in mind, and features a straightforward design with all the menus and settings available with just a few clicks. PERMANENT ROOMS – Omega Cloud admins can now give users access to permanent rooms that can play host to a video conference at any time. Clicking on one of the rooms will populate a meeting invite with the permanent room’s dial-in details. The Omega Cloud Web Portal allows IT managers, VC organisers and guests alike to maximise their company’s return on investment. 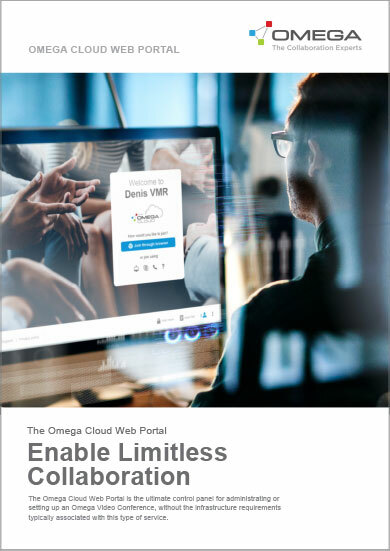 Click on the whitepaper or contact us on 011 258 5400 to learn more about this new Omega Cloud service’s full list of features and benefits, or visit The Omega Video Conference Plugin for Outlook webpage to see how these two offerings complement one another.